Evening to you all ! Baby Dane is 7 months old !! Happy Afternoon to All !! Good morning to all !! 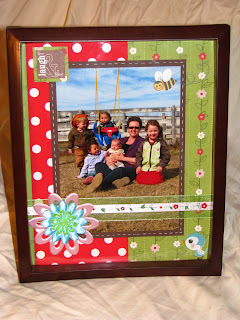 Here is a scrap page I did for my mom who want a picture with all her grandkids, it is 8x10 and done with Imaginisce, twitterpated glossy paper pack and accessories , then I framed it for her as well.